Protesters burnt tyres on roads, disrupted of vehicular movement and rail traffic at several places in the state as a 12-hour shutdown called by 46 indigenous groups in Assam against the proposed Citizenship (Amendment) Bill, 2016 began Tuesday morning. The shutdown, backed by the opposition Congress and the BJP’s ally the Asom Gana Parishad (AGP), has been called from 5 in the morning till 5 pm. Essential services have been kept outside its purview, reports Hindustan Times. The bill proposes to grant citizenship to religious minorities from Bangladesh, Pakistan and Afghanistan. Assam’s indigenous groups oppose the bill as they feel it will marginalize them by encouraging more migrations of Hindus from Bangladesh. “We have been forced to call for the shutdown as we have no other alternative left to protect rights of the indigenous Assamese. We want to warn the Centre to desist from tabling the bill in Parliament,” said Akhil Gogoi of Krishak Mukti Sangram Samiti (KMSS). Opposing the shutdown, Assam’s BJP-led coalition government has ordered all state employees to attend offices and threatened traders and business establishments of revoking their licenses if they downed shutters. The government also promised adequate security arrangements. But despite assurances of safety and threats of revoking their trade licenses, shops and business establishments at most places remained shut. 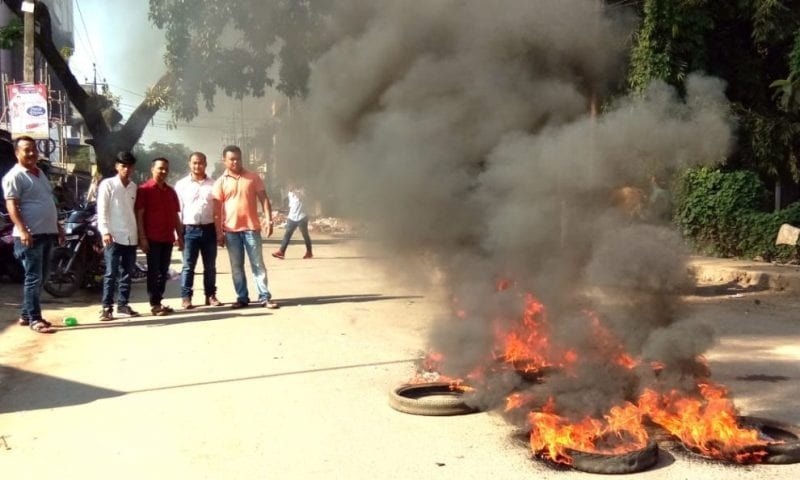 Members from organizations like KMSS and Asom Jatiyatabadi Yuva Chatra Parishad (AJYCP), both supporting the shutdown, burnt tyres at several places in Guwahati since early morning to stop vehicles from plying. Similar incidents were reported across the length of the state from Nalbari, Sibsagar, Jagiroad, Goalpara, Mangaldoi, Tezpur, Jorhat and Golaghat. In Golaghat, supporters of the bandh vandalized a bus carrying passengers while trains were disrupted at Kaliabor and Amguri. Police have arrested nearly 100 protesters from several places. Tuesday’s shutdown coincides with a joint parliamentary committee (JPC)’s meeting over the citizenship bill ahead of its expected tabling during Parliament’s winter session in December. The opposition Congress has supported the shutdown along with the United Liberation Front of Assam (ULFA)’s pro-talks faction (which has already given up arms and are in talks with the government). “We support the shutdown as the Congress also believes the proposed bill should be scrapped,” said Congress’s Assam unit president Ripun Bora. The Asom Gana Parishad (AGP), which is part of Assam’s ruling coalition, has also opposed the bill and is holding a separate programe in Guwahati on Tuesday. “The bill violates tenets of the Assam Accord of 1985 that sought to protect rights of indigenous Assamese. We will quit from the government if it goes ahead with enacting the bill,” said AGP president Atul Bora. Clause 6 of Assam Accord provides that constitutional, legislative and administrative safeguards shall be provided to protect, preserve and promote the cultural, social, linguistic identity and heritage of Assamese people. Indigenous groups feel the Bill will violate this clause. The BJP’s state unit chief Ranjit Dass called the shutdown “politically motivated, against the state and its people and misleading”. In a statement, Dass asked people not to support it.